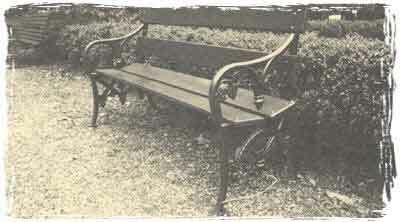 Architectural Iron Company has been authorized by the Trustees of Gramercy Park, in New York City, to reproduce the original Gramercy Park Bench. Perhaps the only authentic design in production today, it weighs over 100 pounds and is five feet long. New in 1986, this truly impressive authentic reproduction is available now exclusively from Architectural Iron. At Architectural Iron, we take pride in our reputation as "purists" in the restoration of historic iron work...and in the creation of reproductions and new design iron work that incorporates historic value. We seek to duplicate the original methods and materials of the craft, whenever possible. And our "purism" is not necessarily reflected in higher costs. Backed by our long accumilated store of ever-growing knowledge and experience in early iron work...we have assembled the facilities, equipment and skilled craftsman to aviod the costly mistakes encountered by firms and foundries where historic ironwork is a sideline. And...while we intend to remain small enough to deal with each project on an individual and personal basis...our wealth of experience and reputation for superior quality workmanship, has given us the ability to maintain a volume of business that is necessary for a cost-controlled operation. At our shops and foundry in Pennsylvania, we work with projects ranging from a single small casting weighing a few ounces...to a major restoration of a cast iron fence, where one single post may weigh over a thousand pounds, and be made-up of literally dozens of castings. "We can create an entire project from a fragment, a photograph, or a measured drawing." "The need for restoration is the result of accidents, removal, long neglect and/or improper maintenance." "The interest in restoration is the desire to share a beautiful architectural art form...with future generations." "Authenticity is often important. Thorough execution is always essential." As many contemporary and historic works are a combination of wrought and cast iron, and contain many points of attachment, each restoration project is unique...as it will often duplicate the procedures used when the iron structure was originally made. Consequently, there are usually many steps involved in most restorations of fences, stair rails and balusters, balconies, roof crestings, window guards, statuary, and the like. On the 'Restoration Process' page, we outline a general procedure we use in many or our restorations.